If only there was a machine that could make more time! Many of us find it a challenge to find time to sleep, let alone find time to make art. Do you have strategies to make time for your art? Last year I did a year-long project titled “Picturing Dialogue.” Because I had deadlines and a lot of other artists to answer to, it kept me on task and focused all year. So for me, deadlines and people to answer to are a good start. But here I am on January 13th and I’m finding myself in my old patterns. On Empty Easel, in an interview with Rice Freeman-Zachery, I found the idea to QUIT WATCHING TV – Now I know an artist who has pretty much done this and her art output, on top of a full-time “regular” job, is amazing. In quality as well as quantity. In fact, Rae is an inspiration to everyone who knows her. But I like TV and at the end of a long day it’s often the only thing I have the energy for. Although I’m still cross at the story-line for last night’s Downton Abbey. In Cathy Johnson’s Tip #33, Making Time for Art, she suggests MAKE AN APPOINTMENT WITH YOURSELF and keep it, just like any other appointment. 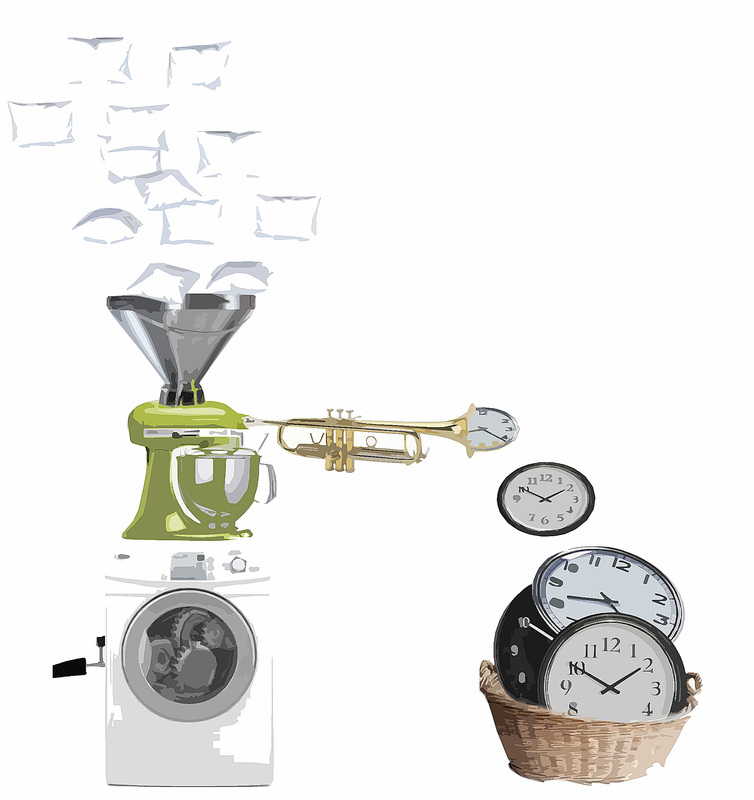 Balzer Design’s 5 Ways to Make Time for Art, has two tips that struck a chord for me: LET THE CROCKPOT DO THE COOKING and Set Limits for Computer Time. Perhaps I can improve my art making habits and my eating habits with one tip! And I love the computer… I love reading the news, looking for recipes, reading email, blogs, Facebook, watching Henri videos… uh oh, and that’s just a small part of the list. I’m beginning to see a problem here. Do you have strategies to “make time” for your art? Please share in the comments! I’ll try these out and let you know how they work for me. This entry was posted in Art, Business of Art, Personal Stories, The Business of Being an Artist. Bookmark the permalink. Hi Ginger, I worry about the same things you do, screwing up a big project, not doing what I’m supposed to around the house, and not making something that fits my vision. I don’t have a strategy for making more time, but I have noticed this last month that I’m really eager to get into the studio and work on a project that I find really fun. I do worry that what I’m working on is too crafty, doesn’t fit my vision (yet) and that I might regret spending the time on it in the end. However, I didn’t read my email for 2 days last week because I was too busy having fun in my studio. I also worked after dinner for an hour 2 or 3 times, and “snuck” in an extra hour when I was supposed to be cleaning. On the weekends I look forward to getting up and getting back to it. I would like to find a way to keep that freshness and enthusiasm going. It seems to dry up when I get in the middle of a big, overwhelming project. I think for me it’s mostly mental. I notice Rae is very enthusiastic and high energy. I don’t think she worries about housework. If something needs to be done, I bet she jumps in, does it, and then goes into the studio. I confess the only t.v. I watched this week was Downton Abbey. This post hits the nail on the head for me. Before the computer existed as well as cable TV I got much more work done in my studio. Now not only do I have those two time wasting/sucking things in my life, I also have a grandson who comes over every single day after school and stays for dinner and homework until about 10PM. And my elderly, housebound parents call me nearly every day to run some type of errand for them. And I try to swim every day for my own self preservation. it isn’t easy.